I know they have been working hard “backstage” now it’s finally out. 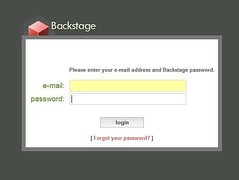 This is their login page for users, it’s now called Backstage replacing the name my.site5. This page isn’t quite designed for Firefox as you can see the new logo hidding behind the login box. After login the new interface is like below, it’s almost like a blog. 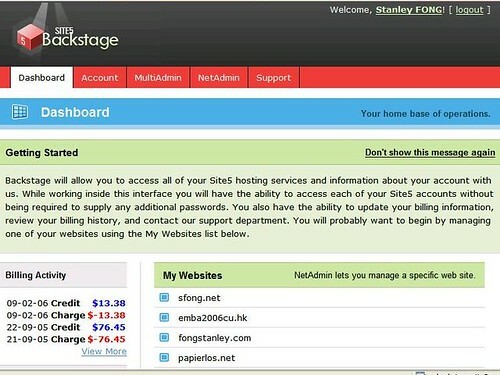 At the moment you’ll still be directed to the old interface for Multiadmin and Netadmin. I’ll sure new interface for those will be out pretty soon. By the way the stats displayed on the sidebar are from various little plugins by Anders holte Nielsen, the names of these plugins are CatCount, ComCount, MsgCount, UsrComCount, UsrCount and WordCount.